End of the Night, originally uploaded by pamhule. 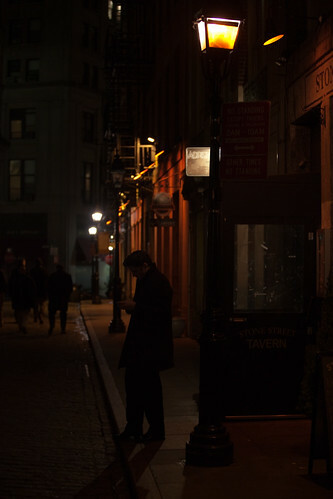 Here's a photo I recently took of a young professional checking his phone on Stone Street in New York. I am generally pretty happy with the outcome. The over-exposure and black-and-white conversion accentuate the graininess. The composition is somewhat interesting. And the streetlight falls nicely on both the person in front and the three men in the distance. Overall, not bad. But did I cheat to get this result? Yesterday, the World Press Photo disqualified one of the winners from this year's contest. This gave me pause. In order to get the result above, I tampered with the original--both with exposure levels and through cropping. Read on to see my original image, the World Press Photo and for some more thoughts on the topic. End of the Night UNALTERED, originally uploaded by pamhule. The two images are very different in feel and composition. Now, do those difference make my alterations wrong--did I cheat my audience in some way? I think not. 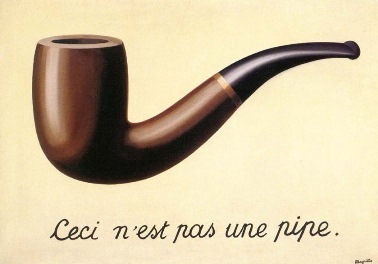 After all, a photograph, like a drawing or painting, is not reality but merely an image of reality. I could have shot in black and white, used a lens with a longer focal length, and perhaps shot in film to achieve the outcome I eventually produced through digital alterations. 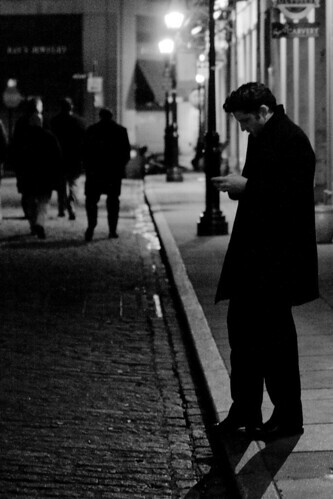 Despite the changes, the final result still captures an actual moment on a New York street. And I am definitely not alone in finding cropping acceptable. Ansel Adams, Walker Evans, and Man Ray, to name a few, were all known to crop their photos. The image, titled “Street fighting, Kiev, Ukraine” originally won 3rd prize in the category "Sports Features". It's an impressive photo. I especially like the heavy grain, which adds a certain toughness to the photo. Together with the title, the viewer is left that the sense that things are really rough in the streets of Kiev. The original photo, however, tells a different story. What is surprising to me is that World Press Photo disqualified the photograph because the photographer photoshopped away the foot behind the hand--not because the image was heavily cropped and retouched in other ways. I don't think removing the foot is troublesome since it simply takes away what otherwise would be a distracting detail. Rather I am bothered by how the photographer manipulated a humdrum, after-school shot into what almost appears like war-like imagery. I am curious to hear what other people think about this. Did I go too far in altering my photo? Should the prize winning photo have been disqualified? I'm a photojournalist, and I don't think you went too far at all with your photo. But perhaps it's not the greatest photo to compare to the other one. Firstly, yours is not "photojournalism", which as you said, should be held to higher standards in order to assure that people can trust the medium and the photographers. Secondly, you took a poor exposure (underexposed) and brought it up a fair amount. He took a well exposed but relatively boring frame, cropped in immensely, burnt in all the edges to create a vignette effect, heavily adjusted contrast, and maybe even added grain to give it a B+W feel. Then he cropped out a foot, which is 100% no-no in the journalism world, as it rightfully should be. You just toned your photo, perhaps a little heavily. He drastically altered it both in content and context. Lastly, I don't even think his photo is good, and the series it was part of--(which won the prize, not this image alone)--is no better. It was very repetitive, over-toned, and boring--especially considering the subject matter, which is very interesting. Thanks for the feedback. I can see why cropping anything out of a photo is not acceptable in photojournalism. But the greater sin in the disqualified photo (and probably the entire series) seemed to me to be altered contrast, vignetting, and so on. So it was surprising to me that the photo might not have been disqualified if the photographer had stopped short of removing the foot. I quoted your article and link in my travelogue post. In this blog I seek to bring out the extraordinary in the ordinary. I also highlight events that I have covered. To view more of my work, visit my photostream on flickr or see my portfolio on this site.